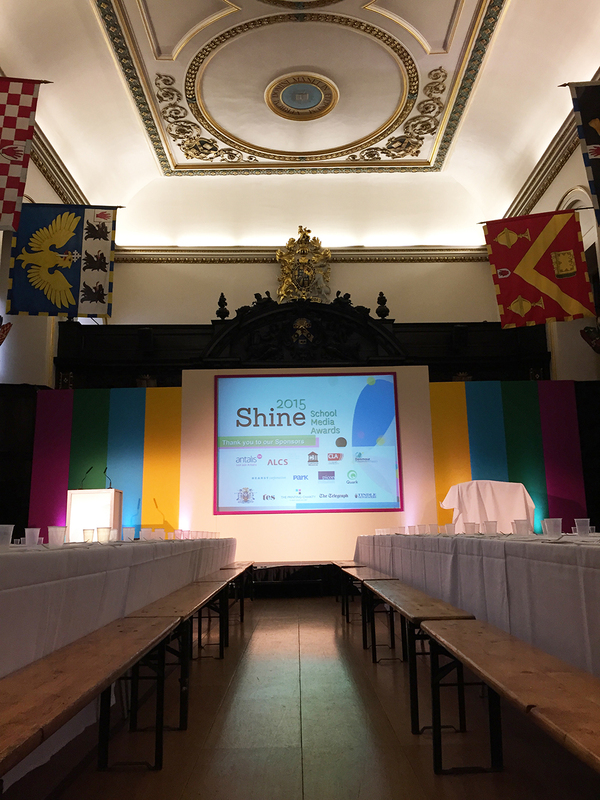 We’ve been involved in the Shine School Media Awards for around a year and a half now. Back in January 2014, I met with the chair and lead print sponsor and talked about things we could do for the awards and that led to a brand, icon and logo design, print brochure for the award winners and in January this year, a new responsive website design. It’s been a lovely project to be involved with, not least because the team behind the project are so enthusiastic about embracing fresh ideas and keeping as up to date as possible. The entrants are mostly in their mid-teens, so probably about as savvy as you can get in terms of consuming and producing digital media, so it has been a fascinating exercise keeping up with them and finding out how they responded to the event. This year we produced the winners book again, and saw it for the first time at the ceremony yesterday. It’s always fun to tune up a design from year to year and so we created a new front cover this time around, as well as adding new ideas to the design of the interior layout – and working on new pages such as some of the more ‘advertorial’ sections provided by the Stationers’ Company and Foundation. We worked with Pure Print Group and Denmaur Papers on the winners’ book and they supplied a fantastic end product – including a gorgeous spot-UV varnish on the front cover. The paper used as a new one for us: Amadeus recycled and we used a silk for the front cover to best accent the spot-UV and an uncoated text section. As last year, it was such a thrill to see everyone leaving with their book at the end of the event and searching frenziedly through it to find their work. Plus of course, it’s a great piece of new print design for the portfolio a little different from our usual business and political report design work. The selection of work was better than ever – I was lucky to see the full selection of work at our initial judging session in May – and it was fascinating seeing all the entrants poring over their competitors’ publications.